I’ve been wanting to do this for a long time. I just needed the perfect excuse. 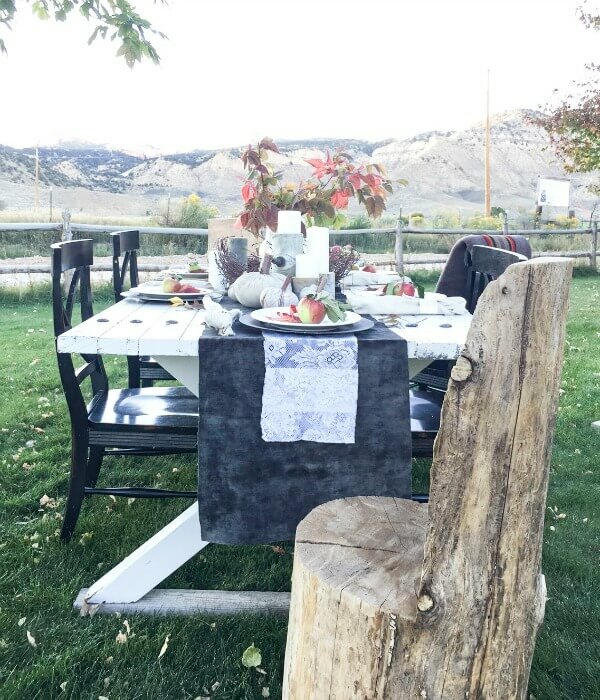 So, when I decided to do this really cool fall tablescape blog hop, I knew just what to do. 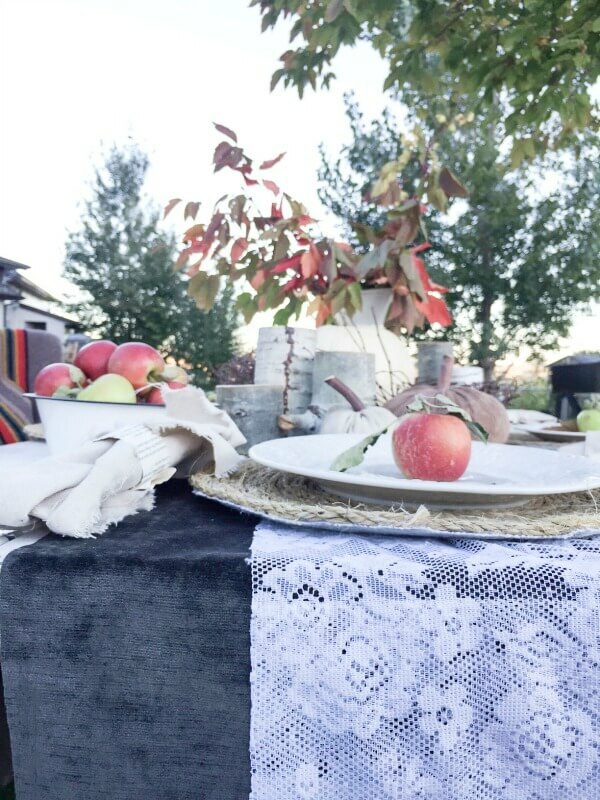 I have always wanted to set up an extravagant and stylish outdoor fall tablescape that my family could enjoy. I was waiting for the perfect day. A day that still has that warm autumn air, but also a touch of the chill that is so perfectly fall. This time of year is my most favorite time to take advantage of my backyard. The leaves are just starting to change colors, and my garden is at the height of its glory. As we spend much time outside harvesting our corn, tomatoes, and many other tasty items, its always feels like there is no time to enjoy the atmosphere. So, I decided it was time. We were going to enjoy our fantastic fall backyard. I set up our picnic table under one of my most favorite trees. Its a cross between a maple and a box elder tree. The wonderful thing about this tree is at just a hint of chill in the air, its leaves start to change to vibrant reds, deep maroons, and beautiful oranges. It gives me the fall feel well before fall actually begins. Everything I used in this tablescape was either thrifted or re-purposed in some way. 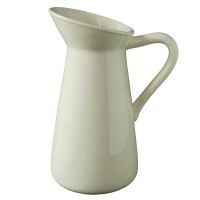 I find satisfaction in creating something beautiful out of simple, unloved objects. I started with some thrift store fabric that I came across a few months back. I found this deep green, almost grey velvet fabric and knew I needed it for something. I also found some simple lace curtains that I thought would be prefect for just thr right project. Using this fabric I created table runners and then layered them along the table. The next thing I added were two twig wreathes I found on clearance because of some damage. 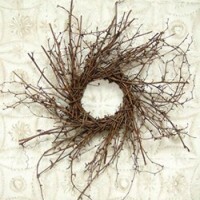 I love the shape of these wreathes and thought they would be perfect on my table. I placed a white pumpkin in the center of the two wreathes and then added a tall white pitcher full of fall leaves from my tree to the center of the wreathes. I created these rope plate chargers the other day(there will be a post coming along soon about how I made them). 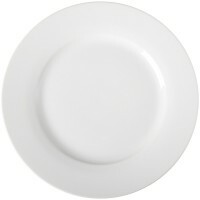 They go perfect with my simple white plates. 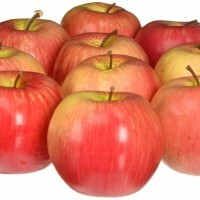 The other day we started to pick the apples from our one and only apple tree. They are always sweeter after the first frost, which came much earlier this year. We usually wait until sometime in October for that. Well, anyways, I guess the good things about an early frost was being able to pick some very tasty apples. 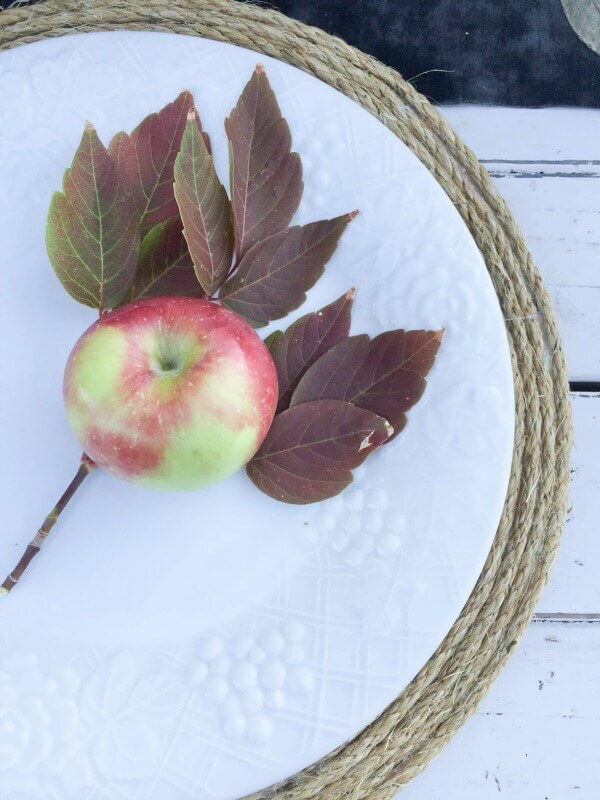 I topped the plates with a siple apple from our tree and a few autumn leaves. I also made sure to use my log chairs that my husband made for me. One giant piece of wood, carved with a chainsaw into a chair. I am so very lucky to have been given 2. Napkin rings have never been something I thought I needed, since, with a bunch of kids, I never found it necessary, but I wanted some for this table. I created some really simple napkin rings from an old thrift store book. A few book pages was all I need…(another post coming soon). As I thought about what else I wanted on this table, I really wanted to create a “bountiful harvest” feel. 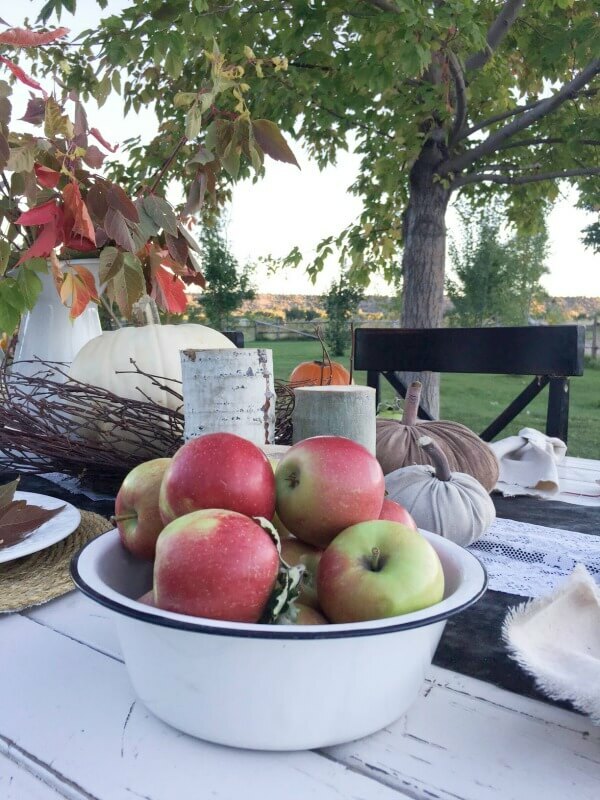 Bowls of apples, and pumpkins galore. 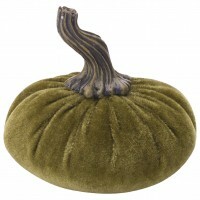 Now, I have a few real pumpkins, but I am still waiting for my home grown pumpkins that arent quite ready. So, I dressed the table with a bunch of fabric pumpkins that I had made a few weeks ago. I also added some Aspen tree limbs to the table, dotted with white candles. My son came out while I was finishing up and was so overjoyed by what he was seeing, and when I told him we were going to eat dinner out here, i just about fell over. I am so lucky to have kids that appreciate the little things I do, as well as the big. I honestly feel that taking just a little bit of effort to create a beautiful space does not go unnoticed by children. I cant count the amount of times my kids have commented, or taken pleasure in one of my millions of home decor projects. When my 4 year old tells me that the room is “fabweeous” I know I’ve done my job. 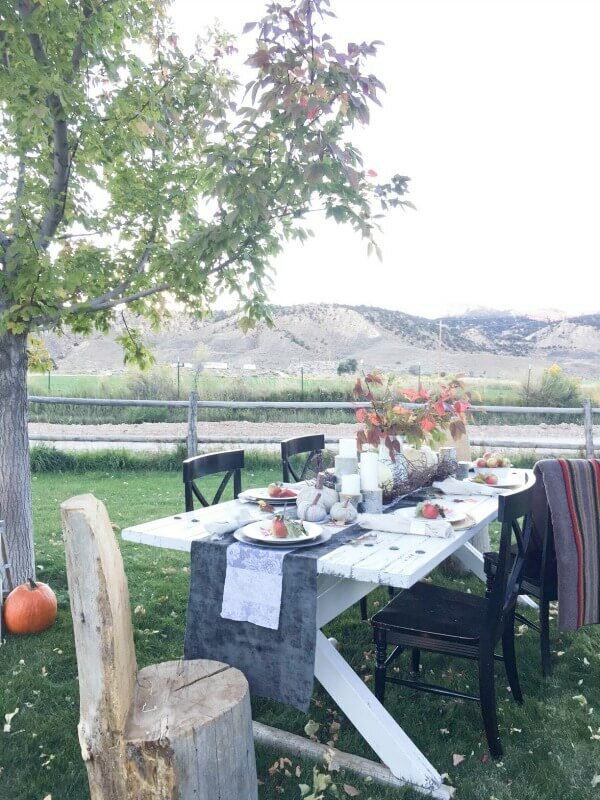 We came and sat as a family, enjoying our backyard, some good food, an amazing sunset, and an inspiring outdoor fall tablescape. I swear I would eat like this every night if I could. We made sure to keep some warm blankets around, like this wool Pendelton blanket. You cannot go wrong with one of these. My husband said it felt like Thanksgiving, and that was all he needed to say. 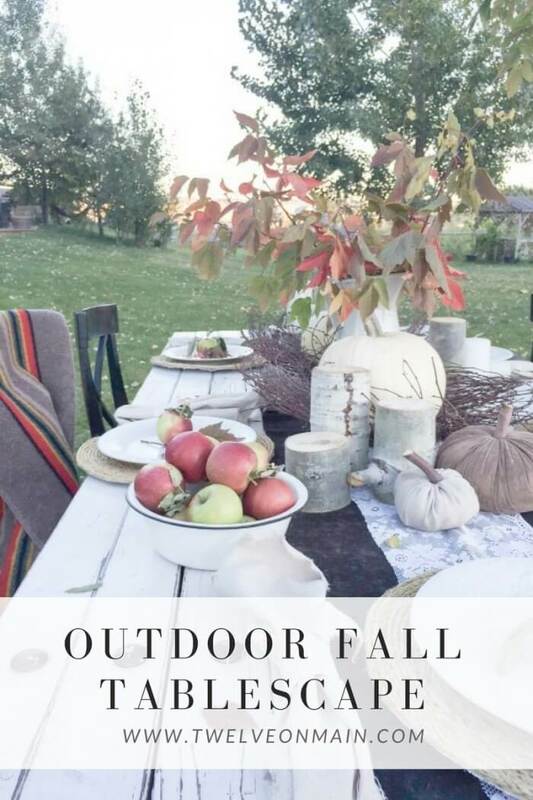 This outdoor fall tablescape is what dreams are made of…well for me at least. I had the chance to spend a fall evening with my family, making memories that I know they will remember forever. I hope they remember the love, the laughter, and the beauty that comes with spending time with the ones you love. Maybe you see this and think its too much work. I for one will tell you, it is not. 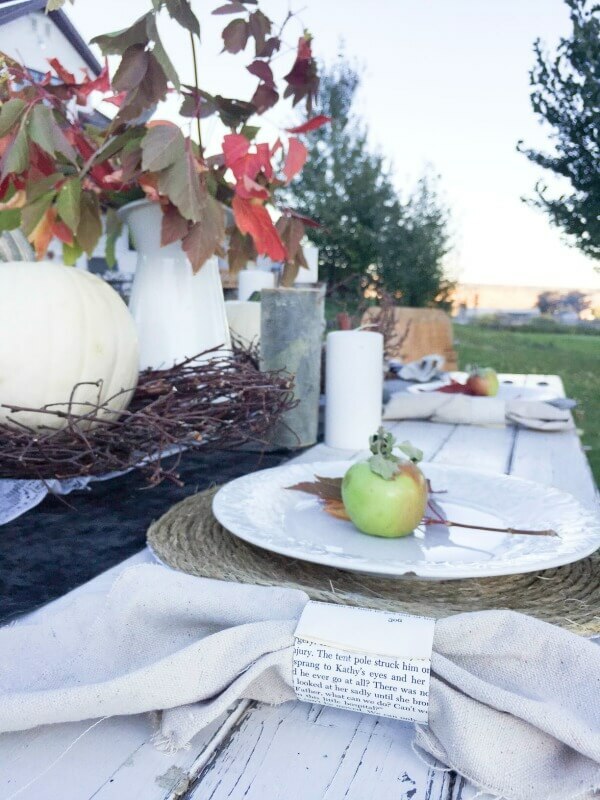 This outdoor fall tablescape was easy to create and cost almost nothing as well. What would you say is your favorite part? I would have to say that mine is the bright touch from the apples. 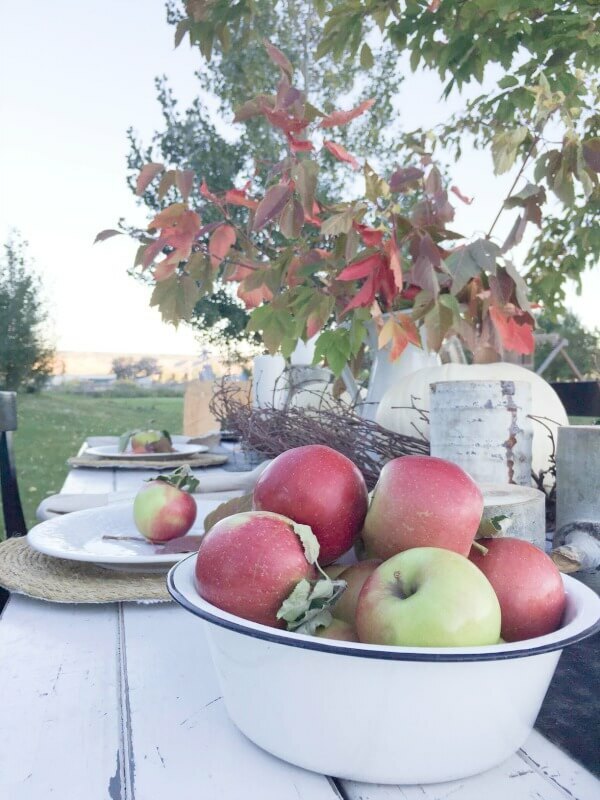 I love growing our own food, and being able to use them in my outdoor fall tablescape decor is just as sweet as the apples themselves. Now, if you like what you see here, you should be super excited to know that there will be a handful of other bloggers posting up throughout the week! 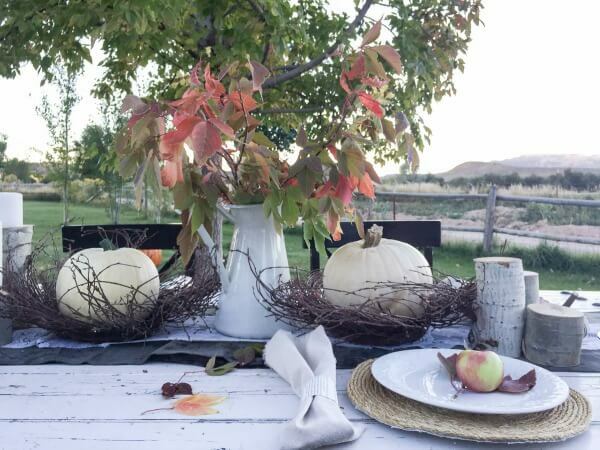 Make sure to check out all the other amazing fall tablescapes throughout the week! Thanks so much for stopping by and spending a little time with me today. I truly hope that when you come here to Twelve On Main that you find something that inspires you. Thanks so much Pam! It was such a fun thing to do and I cant believe I have waited this long to do it! The memories are the best! How gorgeous is your setting for outdoor dining with the mountain views?!! 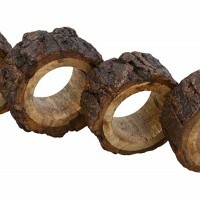 I’m in love with your log chairs too! Thank you Mary, I am very blessed to live where I do. I think that the apples are one of my favorite touches too! Your outdoor tablescape is so pretty and inviting! The outdoor setting is beautiful! I love the rope chargers that you made. I can’t wait to see the tutorial. 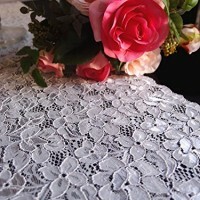 They are a perfect contrast with the lovely lace table runner! Thanks Shannon! That is one of my favorite things to do. Take something delicate and contrast it with something a little more rough. I love the combination as well. Sigh, it’s simply stunning Sara! And those adorable diners! And the fact that your husband said it feels like Thanksgiving! What a wonderfully simple yet elegant table and setting, gorgeous!! 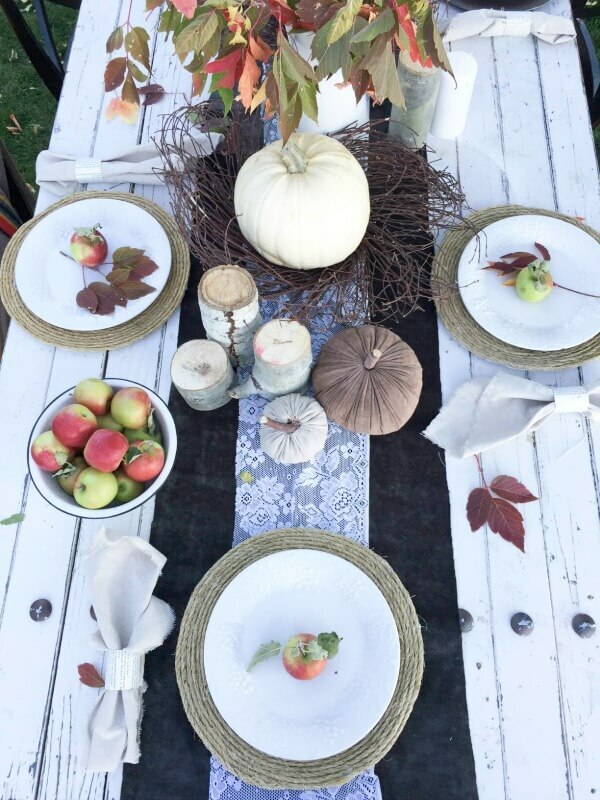 Sara, What a gorgeous setting you have for creating a beautiful fall tablescape. Those chairs made from wood are so cool. You have a talented husband. Your colors are spot-on for the season. I love the idea of the blankets on the chairs. How cozy. I’m happy to meet you and be on the autumn blog hop with you. Carol thank you so much. I do have a very talented hubby, if he would only do all the things I wanted him to. Haha, but I cant keep him working all the time, can I? 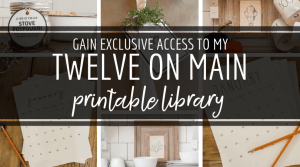 I am so glad I was able to join in on this blog hop! It has been so great meeting some new and very talented ladies! 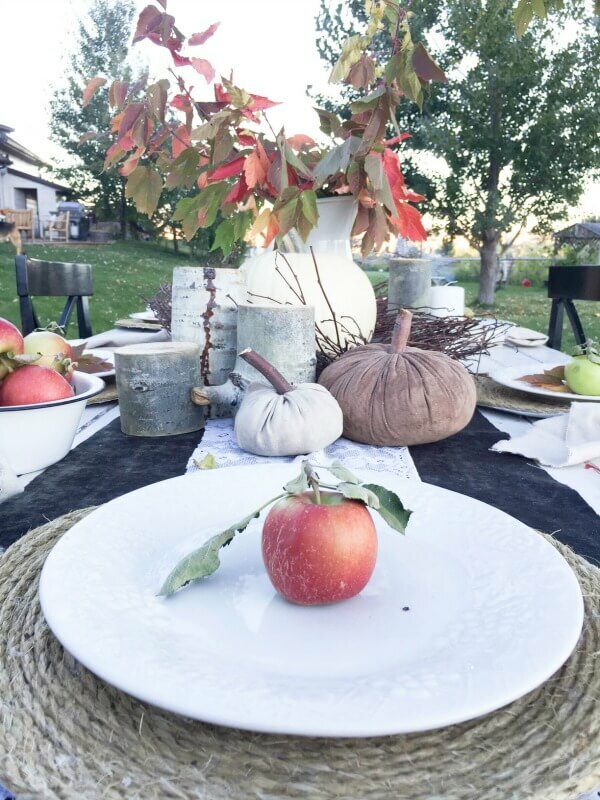 How blessed you are to have such a lovely natural space to set such a beautiful Autumn tablescape! 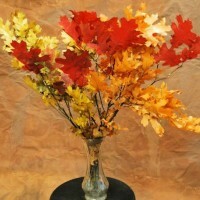 The leaves in the white vase are so pretty, I am missing the change of color of leaves, I need to make a trip up North! It is so delightful that your son was thrilled with your table and having the opportunity to sit outdoors for a lovely meal! 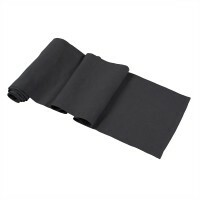 That velvety fabric was the perfect color to set the theme for your table. 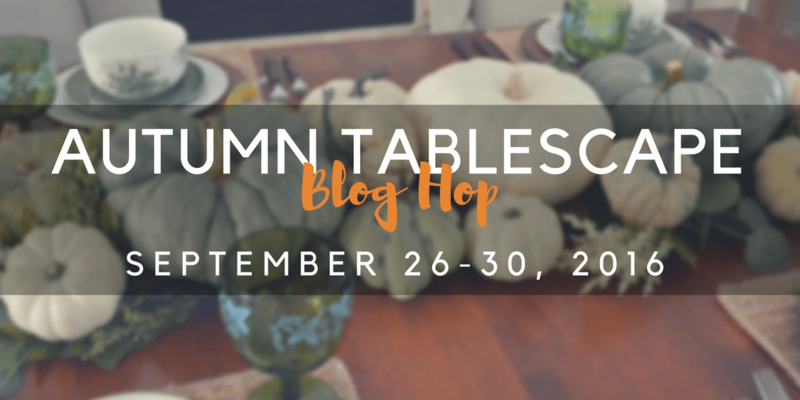 Thank you so much for being a part of the Autumn Tablescape Blog Hop! Chloe it has been so much fun to work with all you incredibly talented ladies! This hop was so fun and I am glad I was able to join in this time. I dont think I could live without the changing color of the leaves. I have been spoiled for far too long! Thanks Kristy! I spent a good while drooling over yours as well! I am obsessed with your home, so beautiful! Very pretty setting. I love eating outdoors. Looks like Autumn for sure. Great job. You have beautiful scenery in your backyard. 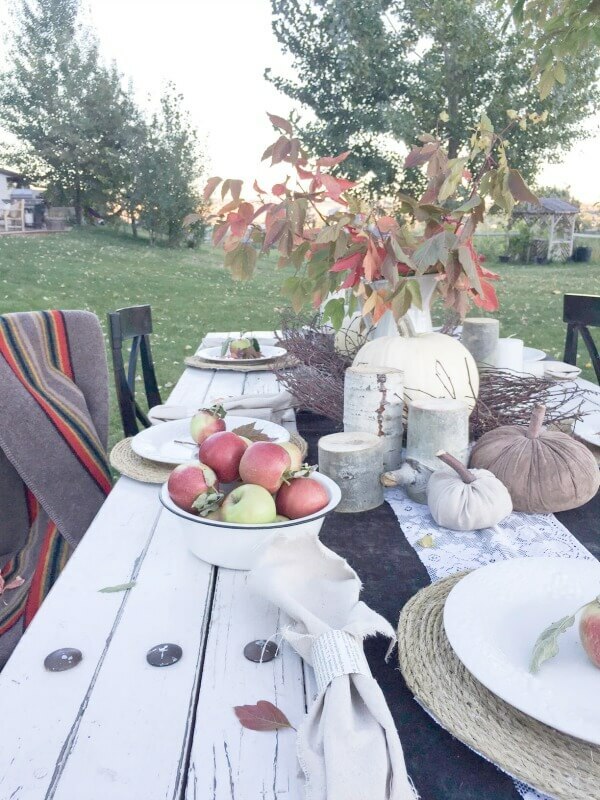 I love the fall tablescape, it makes me want to dress up my outside table and have a fall party! What a beautiful table in a fabulous setting. That fact that you actually ate out there together, enjoying the view, makes it all the more special. Happy fall! Kim, thanks!! It was so much fun, we are definitely doing it again! Sara, I was sooo happy to see you join this blog hop (I am too, on Thursday), but my reason is rather selfish. Oh, I love everything you’ve done with this outdoor tablescape, don’t get me wrong! 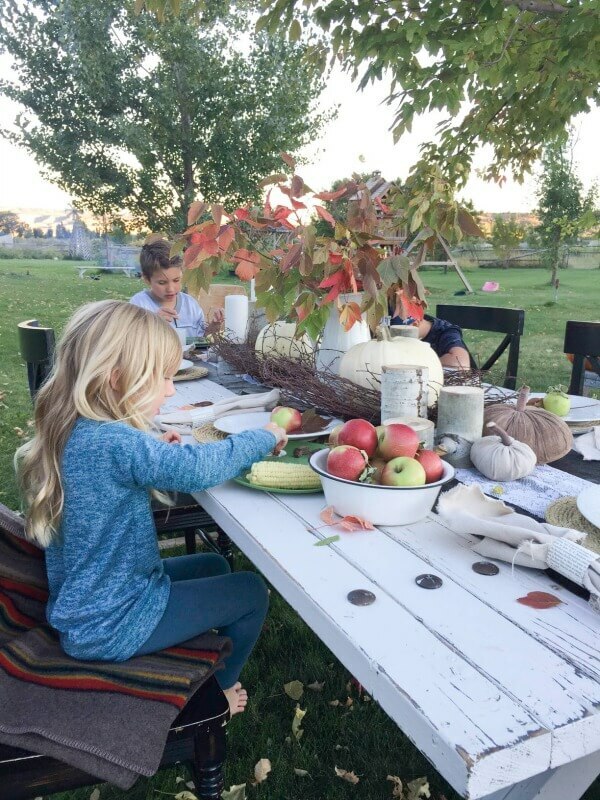 From the log chairs your husband made, to the aspen tree limbs as candle pedestals, to the self-made chargers & napkins rings and the apples….all of it, and your kids’ reactions…priceless. But the really cool thing is where you are! My husband & I just returned from a nearly 7,000 mile trip across the country & back (we live in the state of West Virginia), and our favorite spot? Bryce Canyon! Your place in this world is absolutely gorgeous. Thanks for being part of it. I’ll be following you, and hope to pop back in to visit other posts and get acquainted. Happy Fall! Rita! That is so great that you made it to Bryce Canyon! It is truly a unique and beautiful place and I am lucky to call it home. I am so excited to do this hop with you as well! Its so great to get acquainted with other amazing bloggers such as yourself! 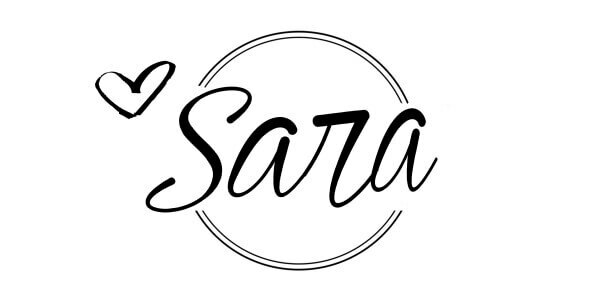 Sara – I’m with you! I love dining outdoors with a little chill in the air. It’s my favorite time of year. 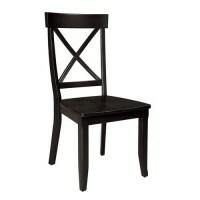 Your tablescape is lovely and inviting. 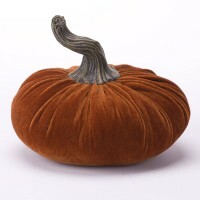 I love the different pumpkins and can almost smell those apples! Thanks Elaine! It is such a great time of year and we try to enjoy it as much as we can. 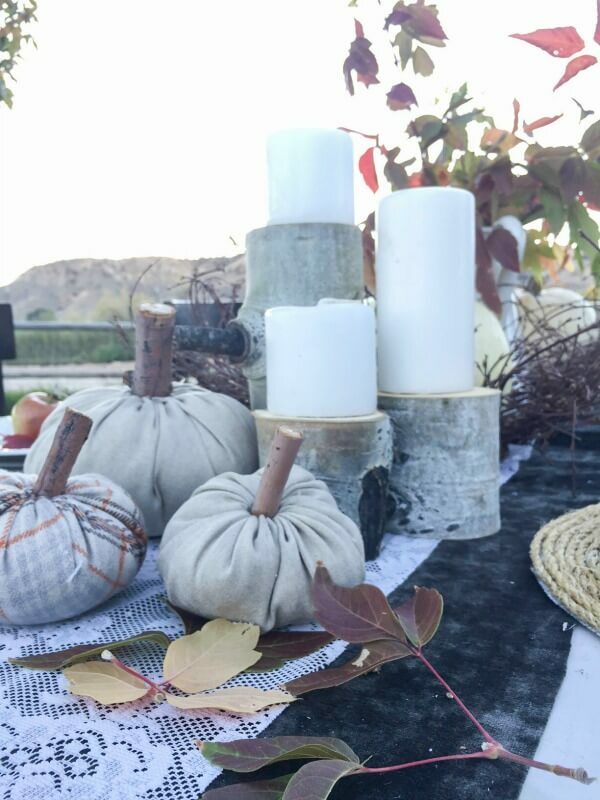 Love your outdoorsy Autumn tablescape. The natural elements are lovely. How special to have two of those log chairs…totally unique. Apples always remind me of Fall. 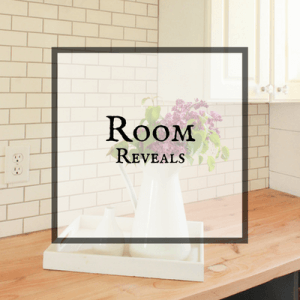 Such a fun blog hop. Thanks Linda! It was so much fun to create this. I dont know why I waited so long to do it! This is soo cute!!! My day to do crazy extravagant tablescapes during the holidays!! This is really stunning, your views are amazing!! How special to be able to share this fabulous tablescape with your family! I love its rustic charm and beauty. The natural elements combined with your tableware make for a wonderful look. Indeed, memories are made when we put in a little extra effort – love that your children appreciated it. Lori, thanks so much! It truly was so much fun for the kids to experience. 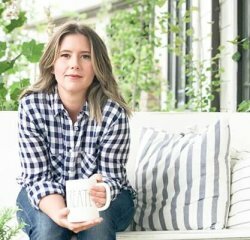 Your tablescape is so down-home charming and your story about sharing it with your family is so touching. I feel so much the same. When the children grow up as adults, it is the wonderful memories around the family table that are such sweet memories that will forever be cherished. What a wonderful use of various materials. I applaud your use of re-purposed items. You bring new love and life to an item that was once just tossed. 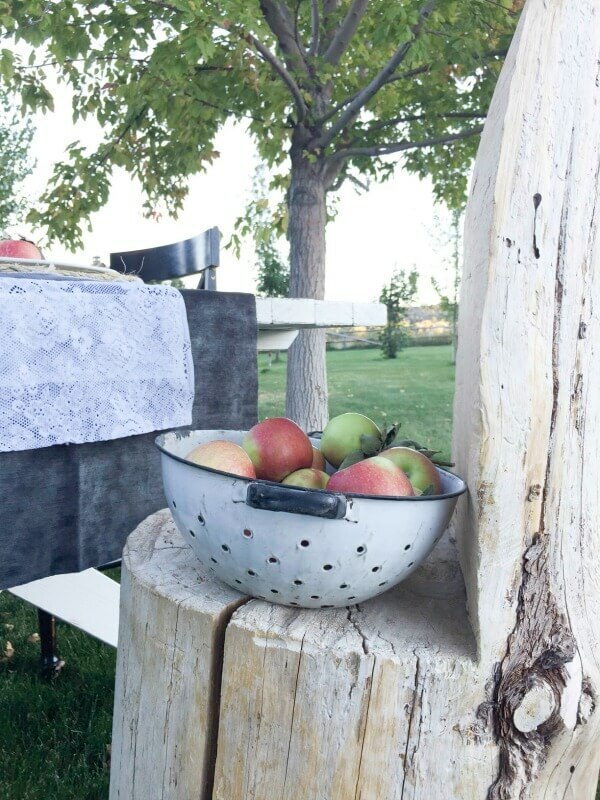 There is such beauty in the natural elements of apples, white pumpkins, twig wreaths and your wonderful log chairs. I could sit for hours at this table! Wow Marsha thank you so much. Your words are so kind! Its was so much fun to create this and I loved spending it with my children. Have a great week! 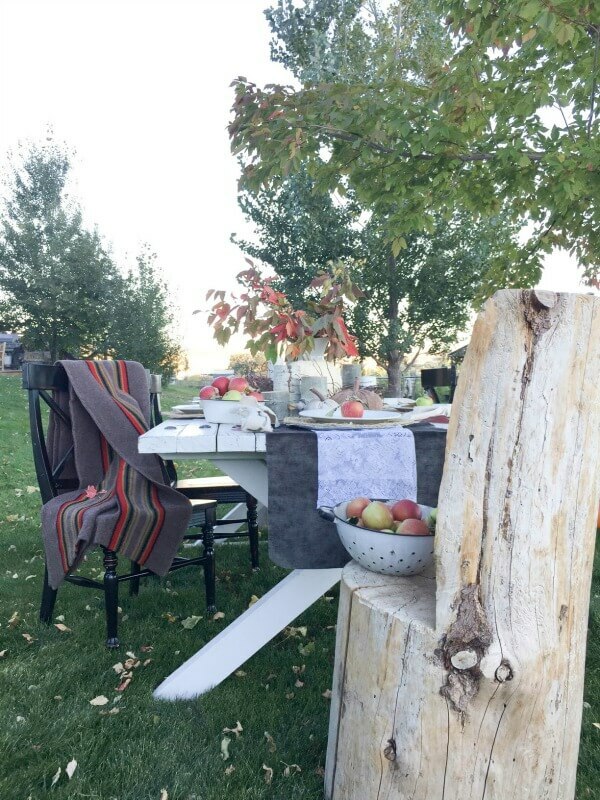 There is so much about this table that I love, but I have to say, “You had me at hubby-made-log-chairs!” How perfectly fall-ish and rustic for an outdoor table. Love! Love! LOVE! Ha! Thanks Kim! I have been incredibly spoiled by him. Thanks for all the kind words! The table and view are just stunning!! I love how creative you were using natural elements and textures in the settings. What a fun outdoor space to spend an evening in. I always love everything you do! This is no different. SUCH a beautiful tablescape. All of the touches of nature are perfect for Fall. I love the tree chair. Everything is perfect! 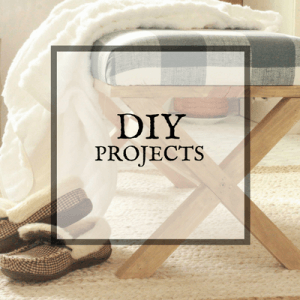 So many simple and beautiful diys! I Lao completely agree that children appreciate little things like this. My kids LOVE when I go a little bit above and beyond for holidays. It just makes even the ordinary special. 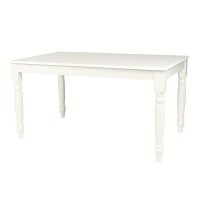 It’s almost impossible to pick just one thing from this beautiful table. I have to say though that the mountains in the background added to the wonderful vibe you’ve created. Simply beautiful! Omg how stunning, both your table and the view and surroundings! What a lovely way to spend an evening… 🙂 Blessed indeed. What time is dinner? I’ll be there! 😉 Look beautiful! Absolutely gorgeous! I love how you used the apples in your setting, and the blankets make it feel so cozy. Sara! Oh MY!!!! What a beautiful table, backdrop and family! I love this idea and everything is simply perfect. Girl, you know how to work some spaces!!!!! 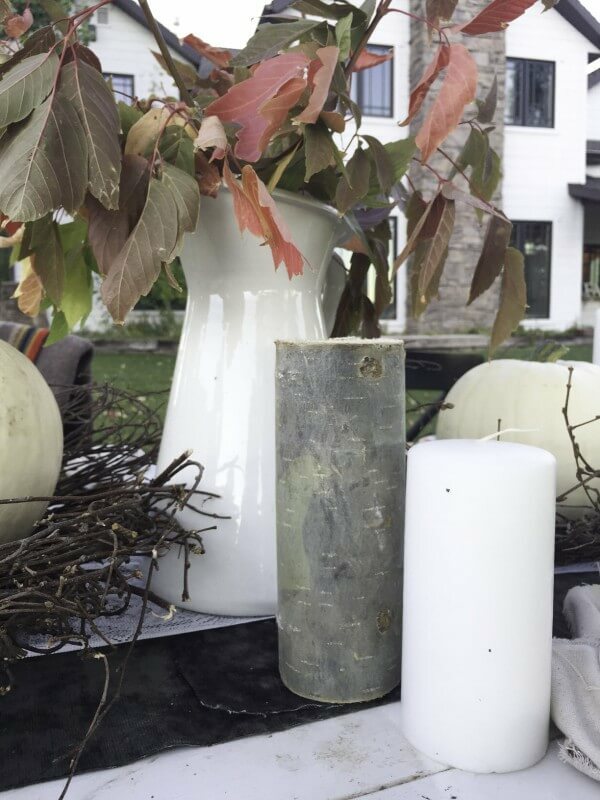 Thank you for sharing your home and autumn tablescape, you are a great inspiration. oh how I wish it was warm enough for an outdoor meal! Love what you did with all the fresh and local greenery. Those pumpkin twig nests? how cool! Everything about this is gorgeous and perfect!! So stunning, Sara!!!! Every time I see that you are in the same bloghop as me, I eagerly anticipate your post because they are always GORGEOUS! You have such amazing style! I swear everything you touch turns to pure (rustic) gold! This is stunning! Such a dream fall tablescape, simply gorgeous! I love all of the nature touches with the leaves and tree elements. I love the apples and leaves on your tablescape. So perfect for fall. Pinned! 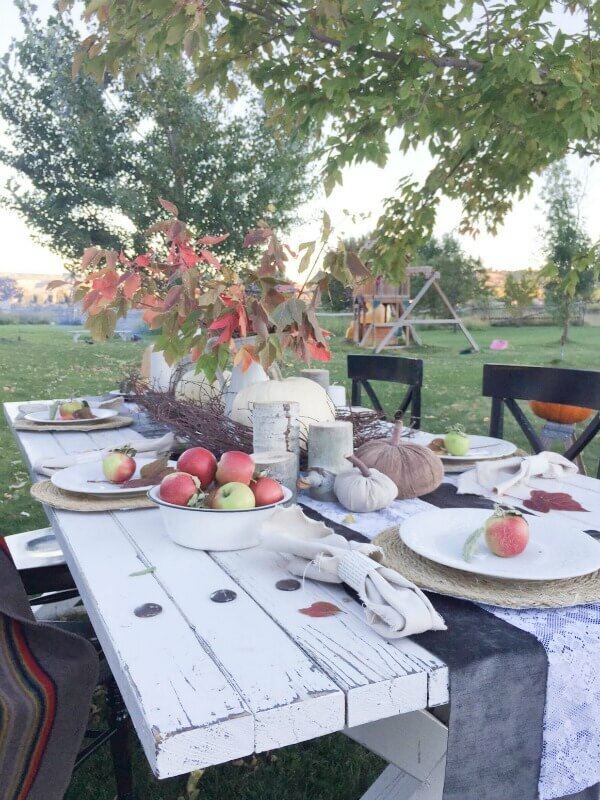 I just love this tablescape, but I especially love how excited your kids get! I would want to eat out there every night too! I always love love your home! 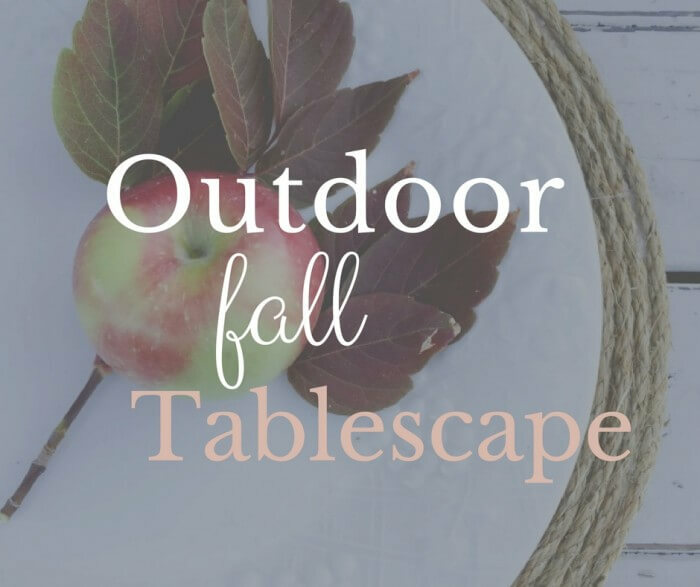 You have such a beautiful space and your outdoor fall table is no exception! It’s simply stunning! Thank you for sharing! Pinning! Not only do I love that it is outdoors, but I love all the natural elements. Those wood chairs for starters! Enjoying meals outside is a favourite and you have created a comfortable welcoming table that anyone would love to sit a spell! This is SO lovely Sara! 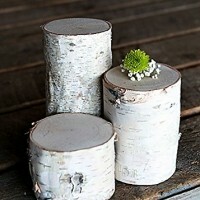 Love the wooden chair and the paper napkin rings! So beautiful! Love your tablescape, Sara! 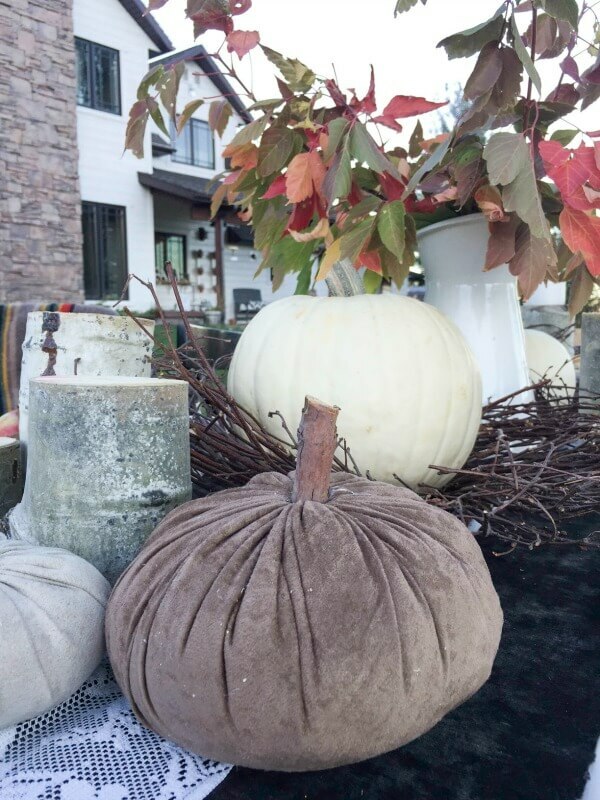 The fabric pumpkins are adorable in their simplicity – especially the plaid one! Love all those apples in your enamel pans. I adore those chargers – must give them a try! Thanks so much for the inspiration! Keep it coming. Absolutely gorgeous Sara!! That view is unbelievable! Love what you’ve done with the table, Pinning! Wow oho wow! Stunning. Such an organic feel. Your tablescape and photo’s couldn’t be more gorgeous! Those log chairs are amazing, what beautiful art! I would love to have some of those amazing chairs. Lor it! So so beautiful Sara!!!! I am always amazed at your stylings!! This tablescape is so stunning. Thanks Stephanie, thats so sweet! WOW! This is so cool! So beautiful! I admire all those output in the photos. Can’t wait to try something similar with this too. So excited! Thanks for sharing this.